As some of you know, I like coffee. It's not that I'm addicted or anything. 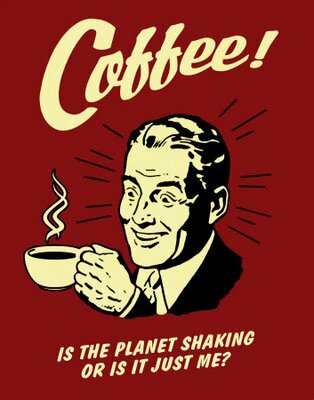 It's just that I'd rather jump headfirst into the Grand Canyon than give up coffee for Lent. But since this is a season of self-examination, I decided to look inward at my coffee consumption and share some possible signs of overindulgence. Think of this as a public service announcement for the soul. Your sermons all begin with pulpit pounding -- except it’s actually your heart. 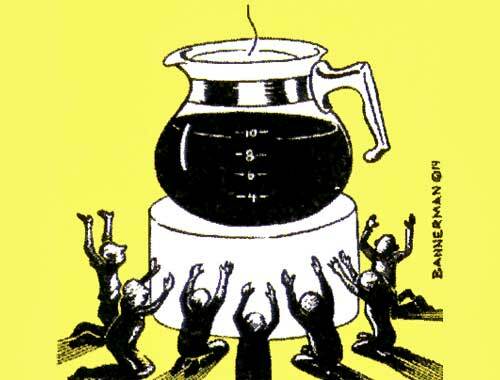 You've seriously considered using holy water to brew your coffee. Even when you're at the altar with arms spread wide in the orans position, your right hand looks like it’s still clutching a coffee mug. “Coffee Hour?” Which hour isn’t? You've asked the sexton to move one of the giant silver coffee hour urns into your office. You wouldn't dream of subjecting your congregation to un-caffeinated sermon preparation. On more than one occasion you've referred to the annual diocesan clergy conference as being Chock Full O'Nuts. “Living water?” You'd prefer a freshly brewed cup of Guatemalan coffee. You get excited when a parishioner beckons you to meet a newcomer named Joe only to realize it's not a new coffee but actually someone named Joe. When someone suggests serving you bad coffee at church you cry indignantly, "Maxwell's House? This is God's House!" I gave up iced coffee for Lent. At first it was really hard, I was getting headaches. I decided to send the money not spent these 40 days to a fair trade coffee organization. We too are big coffee drinkers. We enjoyed the humor. I too gave up a "little" coffee for Lent. The way I did that is I still have two mugs every morning, but instead of my giant 20oz mega-mug, I use my "Lent Madness" mug that only holds 12oz...does that count??? I have never had a cup of coffee, but am drink tea all day every day and gave up sugar in my tea for lent. I truly feel like I can identify with Jesus in the desert. I will admit that, although few can compare with Fr. Tim as a preacher, I have had to sneak off to Upper Weld hall for a cup of tea mid-service. Wonderful! I'll keep an eye on our own priest for such symptoms.